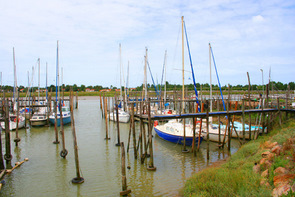 Situated at the very southern end of the Atlantic coast of the Vendée, in the estuary of the River Lay on the Baie de l'Aiguillon, l'Aiguillon-sur-Mer is the mussel capital of France, producing over 20% of the country’s mussels on its extensive mussel beds. The old fishing port, which for a long time was the port of the Abbey of St.Michel-en-Herm, is still an active if small fishing port and on the quayside there are several stalls where fresh fish and mussels can be bought. 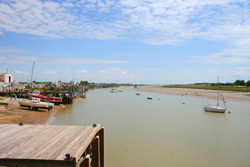 On the old bridge that connects L'Aiguillon-sur-Mer and its neighbour La Faute-sur-Mer one can observe the locals fishing using 'carrelets a square net which is lowered into the rising tide in an attempt to catch ells, shrimps and crabs. The town centre, set back from the river, can easily be missed. It boasts an old church, an active main street with shops, bars and cafes and is surrounded by streets of small whitewashed cottages. 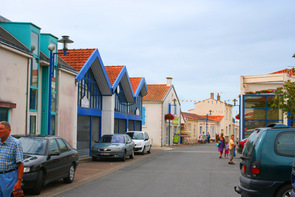 The main tourist road runs alongside the river before crossing the bridge to la Faute-sur-mer. 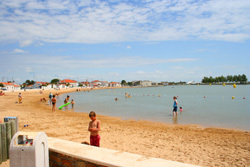 Between this road and the river with its harbour are two manmade lakes with what must be the safest salt water beaches in the Vendée. There are the usual cafes and pizza restaurants for the beach users and a play area for children together with a water slide. 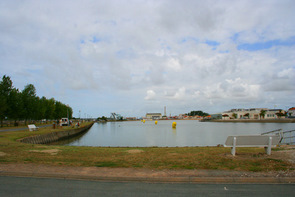 The second lake is home to the sailing school where one can take lessons. 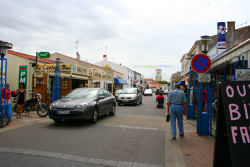 As one would expect there are an ample number of places to eat, from pizza houses to restaurants in and around L’Aiguillon, however as one would expect seafood restaurants are the most common. For those who want to explore the more natural aspect of L'Aiguillon a trip along the road to the 'Point de L'Aiguillon' will not disappoint. On the left there are views across the polder lands, which are fen-like fields that were reclaimed from the sea. Rising out of these low lying fields and towering a dizzy 15metres above them is the islet of 'la-Dive'. This was once an island and one can see where the sea once lapped against its cliffs. Today it is just a cluster of tightly packed houses, it is both unique and charming. Scattered along the road to the point de L’Aguillon one can also view the various oyster farms, where oysters are matured and harvested and where of course they can be purchased. On the right of the road is the river, and for 5 kilometres this is bordered by a large concrete Dyke built by the Dutch who helped drain the land a century ago. Built to protect the low lying fields from the rising tides, it does obscure the view of the river from the road, but it is essential to protect the fields behind it from flooding. 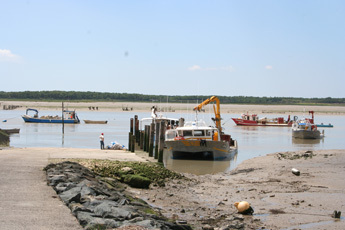 There are several primitive steps curved into the Dyke and a couple of entrances through the dyke itself which enable one to get a view of the small harbours and boat moorings as well as some small sandy beaches, which at low tide are somewhat muddy. The Road terminates at the point, where one can leave one’s transport and ramble over the dunes to more beaches and on to the nature reserve, where thousands of wading birds can be seen. 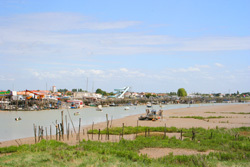 Views out across the Baie de L'Aiguillon reveal the immense extent of the mussel farms, with thousands of poles (bouchets) with ropes attached to them, anchored in the mud. The mussels cling to the ropes, grow and are then harvested. Camping; Aire d'Accueil des Dunes. Tel. 02 51 27 41 58. Camping de la Baie. Lot Baie. Tel. 02 51 56 40 70. Camping Bel Air. Route Bel Air. Tel. 02 51 56 44 05. 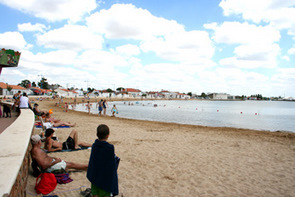 Camping Pres des Sables. Rue Jean Racine. Tel. 02 51 27 13 88. Bike Hire; Bien eric. 33 rue Jacques Moreau. Tel. 02 5156 49 01. Horse Riding; Ranch de Cacharel 02 51 29 42 82. Pony riding 1-4 hrs. Beginners games.